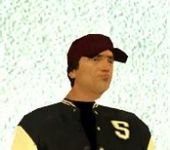 Jimmy Silverman is a character in the Grand Theft Auto series who appears as a minor character in Grand Theft Auto: San Andreas (set in 1992). He is a music producer and manager at Blastin' Fools Records. He is voiced by Gary Yudman. Jimmy Silverman became, at an unknown time prior to 1992, a music producer and manager working at Blastin' Fools Records in Market, Los Santos. In the early 1990s he had been working with both Madd Dogg and Rochell'le and in 1992 briefly became associated with OG Loc after the disappearance of Madd Dogg, caused by the two events that caused him to enter a state of depression. However, later in the year Madd Dogg returned to Los Santos, after meeting Carl Johnson (who had caused his depression) and the two chase OG Loc to the Blastin' Fools Record building while filming a music video, with Silverman threatening to sue Loc for stealing Madd Dogg's rhyme book. Silverman presumably later drops Loc from the company's label. This page was last modified on 9 November 2013, at 22:07.